Guwahati, Oct 22 (IANS) A BJP MP from Assam came under attack on Sunday for comparing Mahatma Gandhi and India’s first Prime Minister Jawaharlal Nehru with garbage. “The Congress has pushed the Nehru-Gandhi garbage into the minds of people over the years and there is now no space for any other theory,” the Lok Sabha member from Jorhat Kamakhya Prasad Tasa said on Saturday at a public rally at Sonari in Sivsagar district. The Congress demanded the MP’s arrest. Assam Chief Minister Sarbananda Sonowal was seated on the podium where Tasa was speaking. The Congress in Assam staged state-wide protests on Sunday in protest against the MP and lodged an FIR in a Guwahati police station. “The MP … described Mahatma Gandhi, Jawaharlal Nehru, Indira Gandhi and Rajiv Gandhi as garbage. Therefore, we seek his immediate arrest and prosecution under the Criminal Procedure Code (CrPC),” read the FIR. 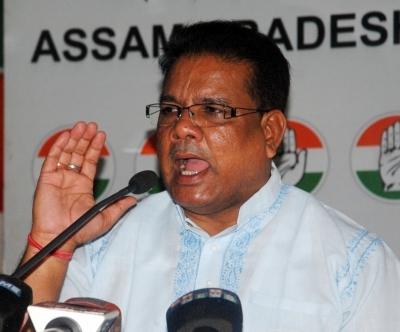 “Comparing Jawaharlal Nehru and Mahatma Gandhi with garbage is an unpardonable offence and we demand his immediate arrest for the crime he has committed,” said Assam Congress leader Ripun Bora.